Congratulations on winning the Bavarian State Prize (from left): Anton Staudigl, Principal of the Freiherr-von-Rast vocational school in Coburg, award winner Paul Wilk and Michael Stammberger, Director Apprenticeship and Training Brose Group. 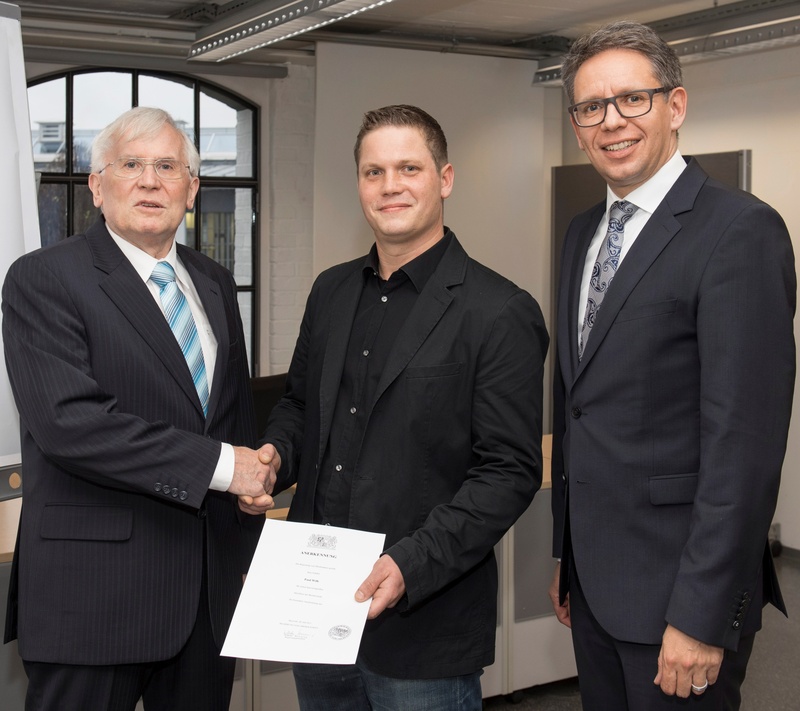 Paul Wilk of Niederfüllbach in the district of Coburg received the Bavarian State Prize in honor of his outstanding performance on his final exam as a machine operator. With an exam result of 1.0 (highest possible score), he is one of the best performers in his class of apprentices. The 31-year-old completed his apprenticeship at international automotive supplier Brose. He was awarded the prize in December 2015 during a ceremony at his employer’s site. “Our international family-owned company offers interesting perspectives in an exciting environment in the automotive sector,” explained Michael Stammberger, Director Apprenticeship and Training Brose Group. He added that dedicated employees had every opportunity to launch a career with the mechatronics specialist, even without a degree. “Paul Wilk is a great example of how motivation and dedication can truly pay off. We offered him the opportunity of completing an apprenticeship and he made the most of it,” said Stammberger. The trained road maintenance worker began his apprenticeship as a machine operator at Brose in 2014. As a temporary worker, he first began working in Assembly Seat Systems. In 2011, Paul Wilk received a permanent position. His commitment and motivation earned him an apprenticeship as a machine operator. “I could never have achieved this grade point average without the support of my instructors,” said Paul Wilk, expressing his appreciation. “They were available and ready to help me any time I needed them throughout my entire apprenticeship,” he explained. He received a permanent position as machine operator at the family-owned company in Coburg in late June 2015. The 31-year-old wants to gain career experience first and then continue with training to become a technician. 350 young men and women complete their apprenticeship or dual-track studies program at Brose worldwide. The company trains apprentices to become mechatronics technicians, electronics technicians, IT specialists, technical product designers, tool mechanics, machine operators and industrial clerks in industrial/technical and commercial vocations. Dual-track studies programs are also available in electrical engineering, mechanical engineering, business administration and engineering and business information systems. The international automotive supplier’s training concept includes various elements such as regularly scheduled language courses and stays abroad at company locations in Europe or overseas for several months. The Bavarian State Prize is awarded to apprentices each year for their outstanding achievements. Graduates with a GPA of 1.5 or better on their final exams qualify for a chance to win the award. The award winners are selected by the respective regional governments.